The Bank of England is lovingly known as “The Old Lady of Threadneedle Street.” In February 1873 a discovery was made that brought “The Old Lady” to her knees. A bill of exchange cashed by the bank was found to be a forgery. It was the drop of rain before the flood. The entire amount stolen by means of forged bills of exchange (promissory notes) came to more than £100, 000. The men who managed this extraordinary robbery were Americans. 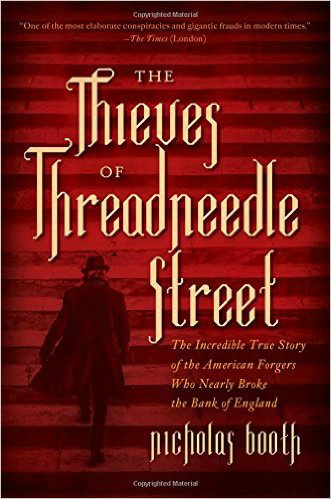 Brothers Austin and George Bidwell, George MacDonald, and Edwin Noyes Hills defrauded bills against banks across the Continent, laundering the money through a false account at the Bank of England. The brothers and their accomplices used a long list of aliases as they obtained genuine documents they would latter forge by using printing houses in Paternoster Row. No single printer made all of the documents, and none really knew that the same man was visiting other printing houses. It says something to the audacity of the swindle when two men using aliases with no permanent address were allowed access to thousands of pounds with little to no trouble. If not for a single mistake, the forgetting of a date on one of the bills of exchange, they might have gotten away clean. As it was it set off a massive manhunt, and they were tracked down in various places by the Pinkerton’s—Austin Bidwell in Havana, George Bidwell in Edinburgh, and George MacDonald in New York. All were finally tried at the Old Bailey, where the brothers were given life with penal servitude. Ironically, they were both released in the 1890’s and began lectures and a magazine on how crime does not pay. Austin Bidwell stated that they used little more than pen and paper and a lot of chutzpa to pull off their scheme. This story follows the crime’s planning, execution, discovery, and the trial and aftermath. I give the book four stars. It is interesting enough, but it does tend to drag at times.